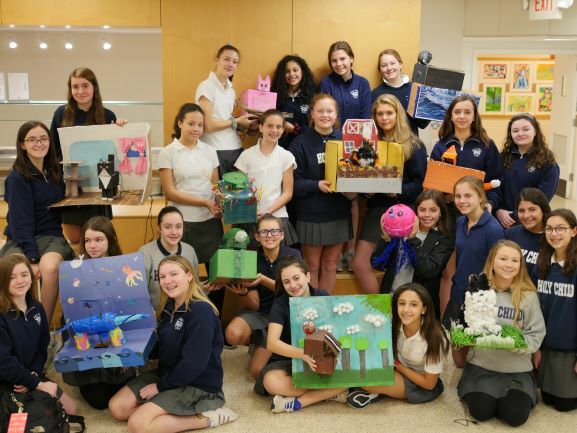 Eighth-grade students in School of the Holy Child’s Design Programming class hosted a wild and wonderful Robotic Petting Zoo on January 24. Using Hummingbird Robotics kits, they built models, which they then coded in the program, Scratch. The pets each had at least two motors and lights that were initiated by a sensor, set off by the pat or touch of a petting zoo visitor. As sensors were activated, tails wagged, fins rotated, and ears twitched. Among the creative crew of robotic pets brought to life by visiting members of the Holy Child community were a pig, jellyfish, chicken, narwhal, bunny, cat, and sea turtle. The project was the brainchild of Michelle Sherry, Director of Instructional Technology and Computer Science teacher, and Christine Farrell, a member of the Middle School Robotics and Math faculty as well as a Holy Child graduate, class of 2005. Holy Child eighth graders displaying their robotic petting zoo models.